Solid features LED pendants in natural materials such as Carrara and Nero Marquina marble, oak and walnut. A pure cylindrical form, crafted from solid Italian fine-grained Carrara marble or solid wood. The rounded inner edge at the shade base is a design signature of the Solid collection. A subtle diffused glow is produced around the lower section when lit. A patented adjustable shade support allows the shade to be hung vertical and straight. 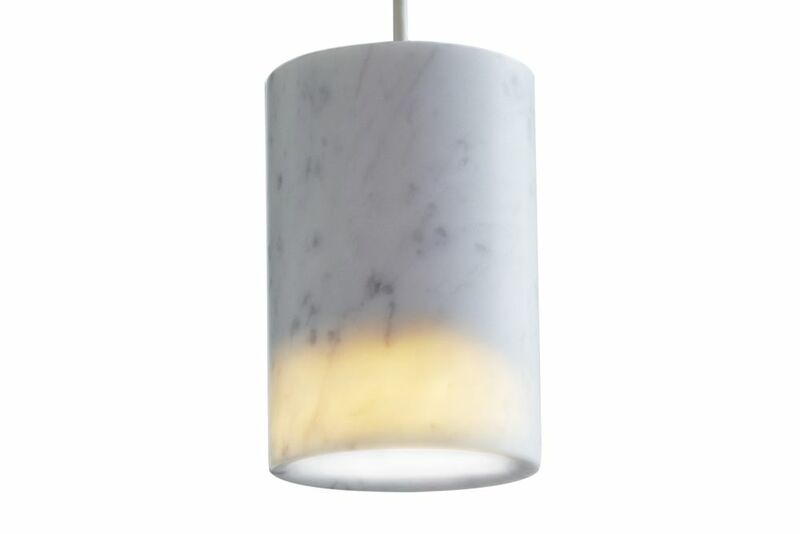 As marble is a natural material the hue and veining will vary from piece to piece, making each shade body unique. • 2 metre matt white cable (Ø 4.5mm, 2 x 0.82), • Conical steel ceiling fixing, powder coated in semi-matt white (RAL 9003). All fixings are hidden. Black ceiling fixing and cable available by special request, • 6.2W MEGAMAN® Reflector Lamp (500 lumen, Warm colour, 2800 Kelvin). Alternative lamp available on request. Fitting takes GU10 LED lamp, 8W maximum.